I can’t blame it on my husband. He has told me over and over that I can improve the house. It’s just that I didn’t know what to do. Again and again, I would start on one thing and hit a road block because I didn’t want to spend the money or didn’t know what to buy so I’d get discouraged and not move forward with the project. Over and over again. Pulling the trigger on purchasing something is super hard for me. I don’t want to waste my money. I want to make a wise purchase, so I put things off thinking the decision will get easier or more clear if I wait, but it never does. 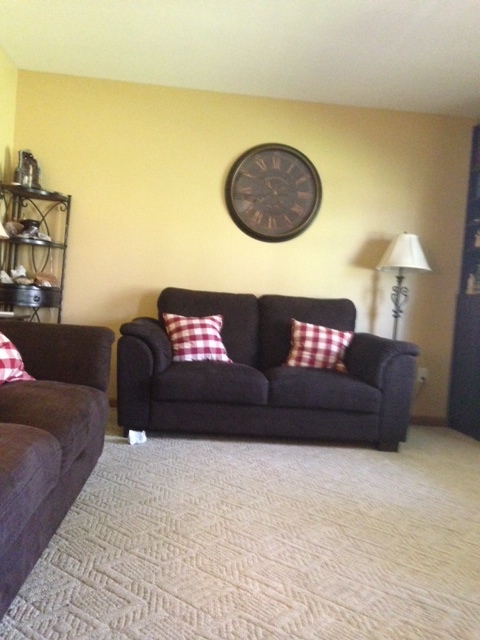 I decided (after a mini breakdown with my husband) that I wanted to update and make the house nicer that it has been. With seven kids and no decorating skills, it was okay at best, and I never invited people over because I was embarrassed about how it looked. Finally after our last home decorating discussion, I asked a lady a school to help. She has been wonderful. She loves to paint and had a home decorating business before she had kids. Now, she just has fun with it. She has been my go to lady to bounce ideas off of, she has guided me gently to where I wanted to be. She has given me advice without being pushy. I feel like she has drawn out of me what I like and don’t like. She has been a true blessing. Anyway, here are the before pictures. Left front corner to opposite rear corner. Picture taken from the entry of our living room. From the far right corner looking at the entrance of the living room. 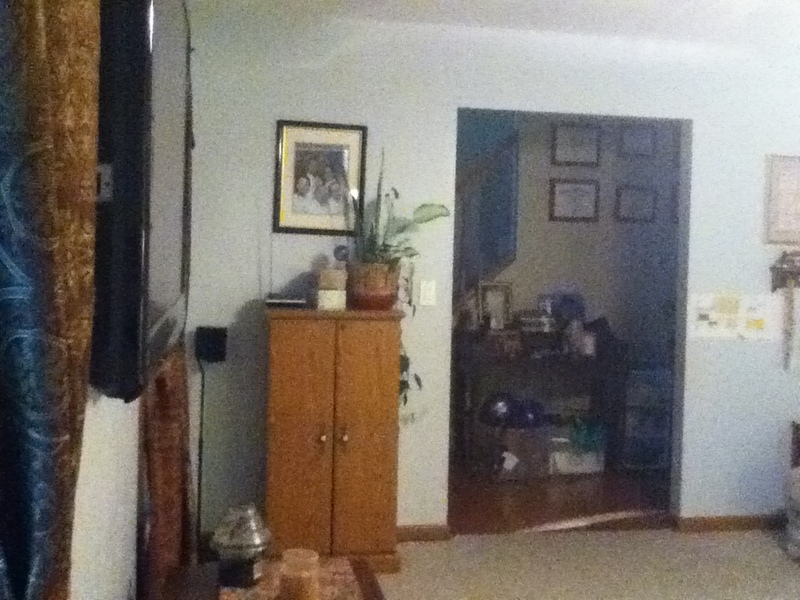 Picture from the middle of the living room. Living room from the entrance from hallway. 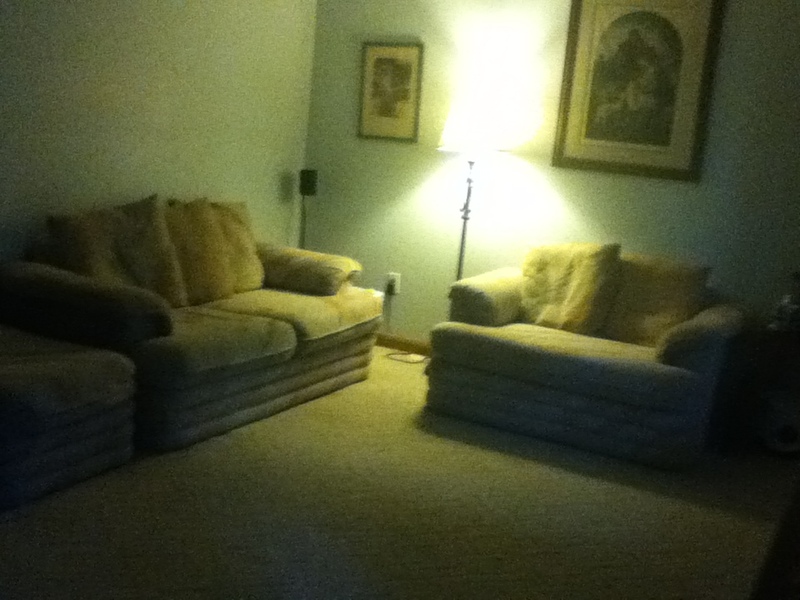 Living room from my chair. 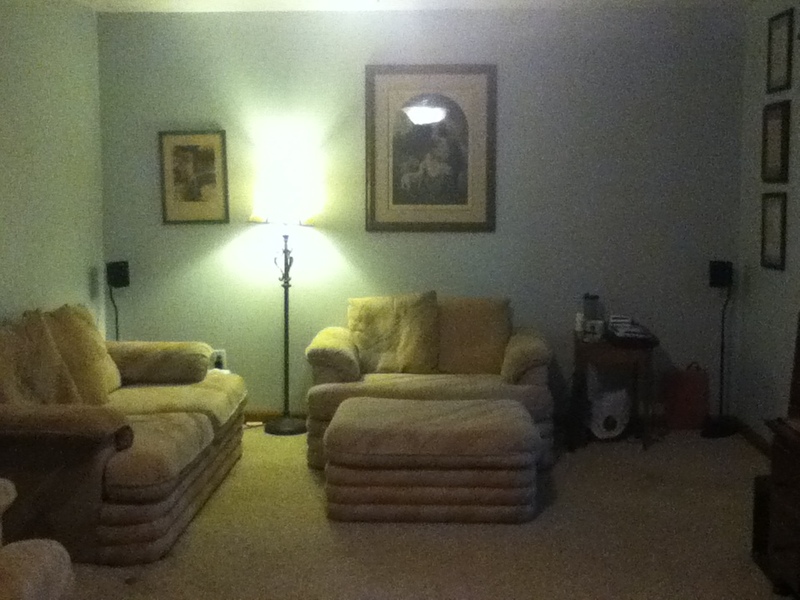 Living room from the loveseat. I purchased 2 Billy Bookshelves plus the extra shelves to make them extra tall from Ikea. I bought 2 corner shelves at Hobby Lobby. 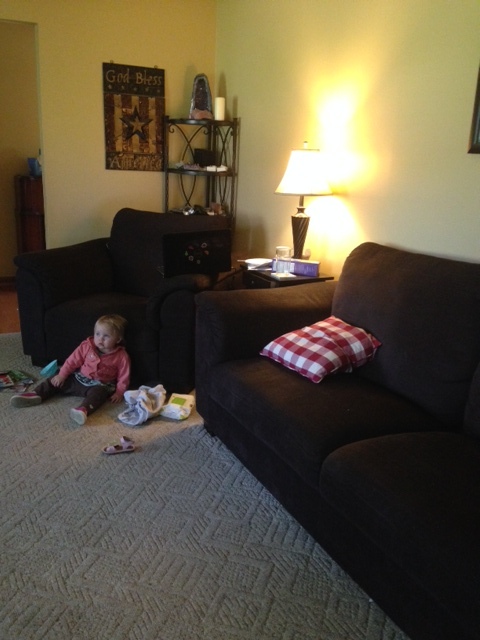 I purchased the couch, loveseat and chair from Ikea. 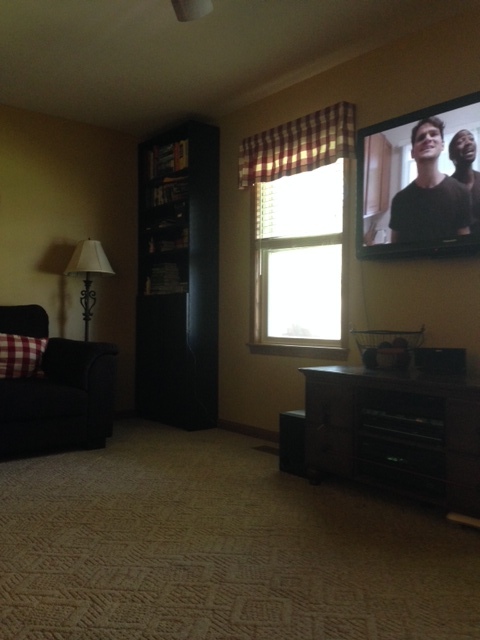 Our entertainment center is a few years old and I got it at Target. We have a flat screen television that is a few years old. My husband loves electronics, so we have had that for a while. I really love all that we have done in here. It is like a whole new house. The only thing left to do in here is flooring. I am still considering my options but am leaning towards laminate or some type of hard surface. No more carpet on the first floor except for the bedrooms. How about you, have you improved anything lately? I have a huge freezer in the garage. I am continually stocking it with things that I find on sale. 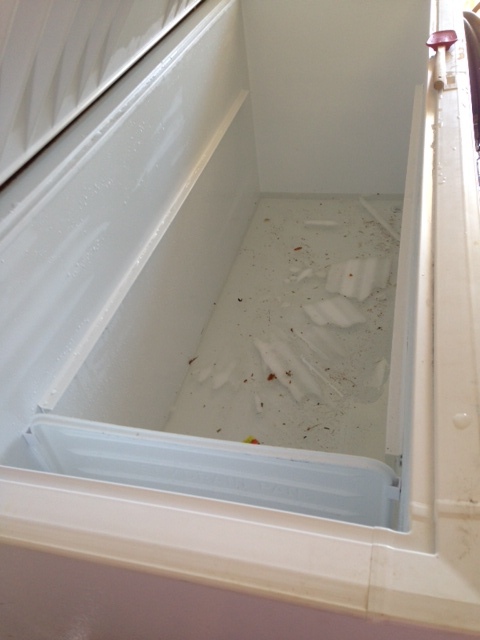 My freezer before. 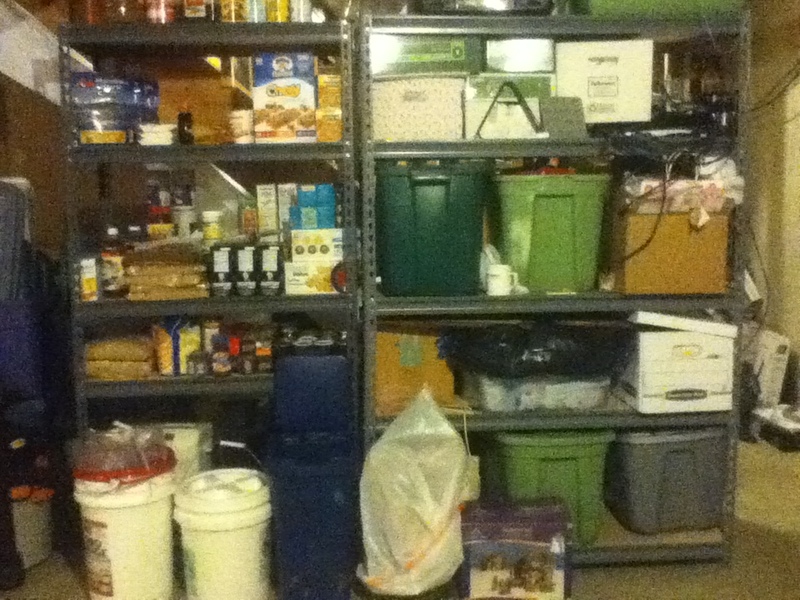 Unorganized, full of frost, and full of food that needs to be utilized. I buy bread from the bread store about once a month and I store the bread in there until needed for lunches etc. I buy French bread and Italian bread from Wal-Mart when it is on clearance for about a dollar a loaf to help stretch our dinners. I buy meats that are on sale, such as hams that were on clearance after Christmas or chicken breasts when on sale for $1.69 per pound. This is all well and good until you need to defrost the beast. I have been needing to defrost the freezer for some time. I haven’t gotten around to it. The ice buildup is so bad that I have 3 baskets that won’t fit and allow the freezer to close properly with all of the ice buildup. 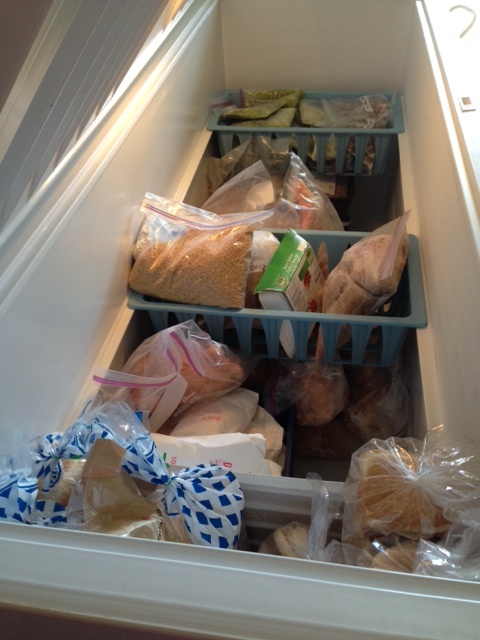 So, my March challenge is to organize and clear out the freezer so that I am able to defrost it. First off, I need to clean out my indoor freezer so that I can keep the things that I really need available through this process. With 7 kids, we need bread etc. The kitchen freezer will be critical to my success. 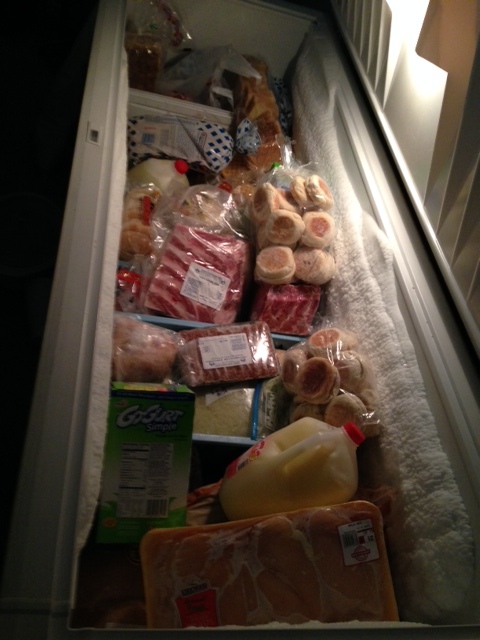 Also, I do have much of a whole pig out in the freezer. Of course, I don’t intend to eat all of that pork in a month, but I do want to get it organized to a point that it fits into a crate or two. My plan is for March is because it is still quite cold here. 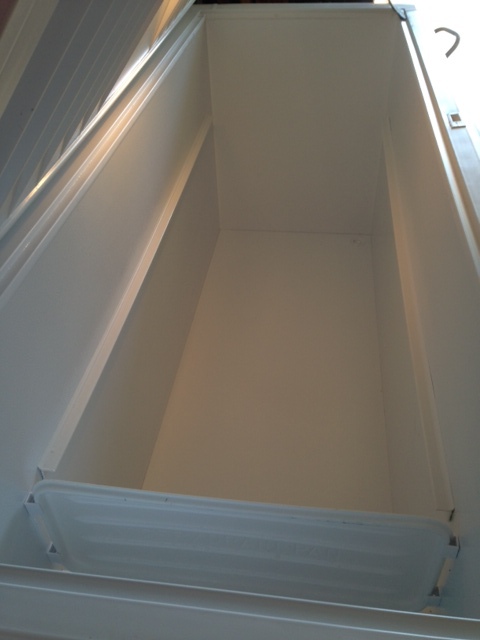 I can put my crates of organized food in the garage where it will still be really cold, unplug, clean and defrost the freezer. 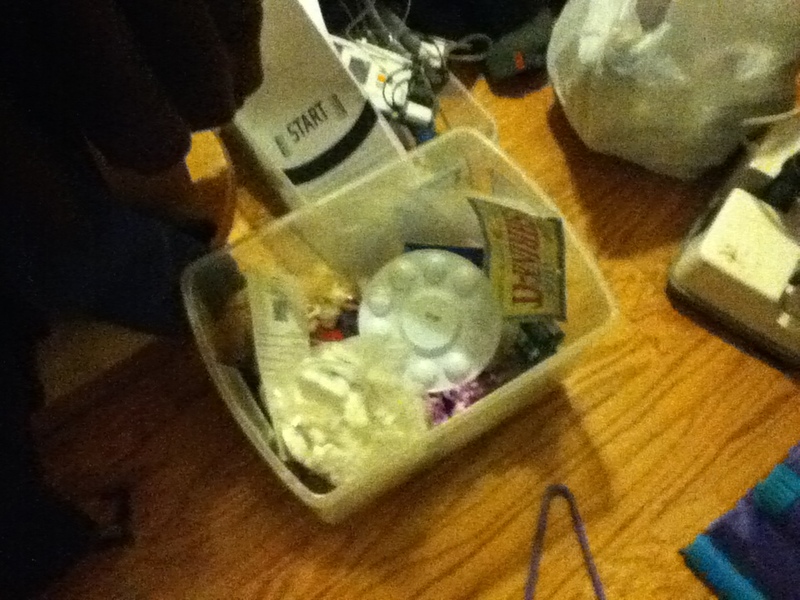 I will then put it back together into a cleaned and organized space ready to be utilized. Besides needing and wanting to get this done, I am hoping the cleaned and organized freezer will help me in a new goal of saving for a short cruise for all 9 of us. The budget is fairly tight, so I am trying to cut our grocery, household, and miscellaneous spending and use the unspent funds to pay for the cruise. I don’t know how it will go, but I’d really like to meet this goal. How about you, are you putting off any chores etc. that you really should do? I’m going to bite the bullet and get something done. Here’s to a great March! My husband got me a pressure canner/cooker for Christmas this year. I wanted one several years ago, but when I started to read about them, I was easily overwhelmed. First off, I didn’t realize that they could do two different things…cook foods or can low acid foods. I put it on the back burner for a while, but after reading a blog where the lady does a lot of pressure canning, I wanted to try it to see if I could save us some money. I used if for the first time yesterday to cook 2 pounds of beans. I wanted to try something easy so I could build my confidence. The beans turned out beautifully. I’m not sure what I was expecting, but it went well. The first thing I did was follow the directions for the quick soaking method. For my beans it said to bring the beans to a boil for 2 minutes, remove from the heat, put a lid on, and let sit for one hour. So that is what I did. During that hour I reviewed my instruction book again. The next step was to rinse the beans. I rinsed them until the water was clear. Then, as per the directions that came with the pressure cooker, I put the beans with just enough water to cover them. I added one tablespoon of vegetable oil to help prevent foaming and one teaspoon of salt to help keep the skins on the beans. This was in the recipe and instruction book. I live in a lower altitude so I needed 11 pounds of pressure for 6 minutes to cook the beans (only 6 minutes!) to the desired softness. I wanted to put them in soup, so I cooked them on the longer side of the scale versus 4 minutes (the shorter side of the scale) to have a harder beans to put in a salad. It took forever to get the gauge to get off of zero. Once the pressure started it wasn’t too long. Actually, it snuck up on me. I looked away when it was at 8 pounds and when I looked back a couple of minutes later, it was at 13! I didn’t know what to do so I moved it off of the heat and set the timer since it was above 11 pounds. The minimum is 11 pounds for the entire cook time. If it had dropped below 11 pounds at any time I would have had to restart the timer to 6 minutes. I think this is to be sure they had enough cooking time to be safe to eat. Does anyone know for sure? I learned that once the pressure is up there, it is really slow going back down. I never did get back to 11 during the actual cook time, it stayed at 13 for the whole six minutes. I let it cool down on its own as per the owner’s manual. After the pressure was down, I took the lid off of the canner and to my surprise the contents looked exactly the same! I spooned out a couple of beans to make sure they were soft, and they were! Amazing to me. There was no less water in the canner that I could see. I don’t know what I was expecting, but apparently beans that hadn’t absorbed the water and looked exactly the same wasn’t it! I found a website that did a conversion of dry beans to canned etc. Here is the link if you are interested. As per this chart, the 2 pound bag would be 12 cups of beans after cooking or eight 15 oz. cans of beans. I love it! I need this many to make a nice big pot of soup for our family. I had these beans for a long time, but I think they were $1.99. The cans of beans at the grocery are between 59 and 99 cents, so that is a big savings over buying store-bought beans. 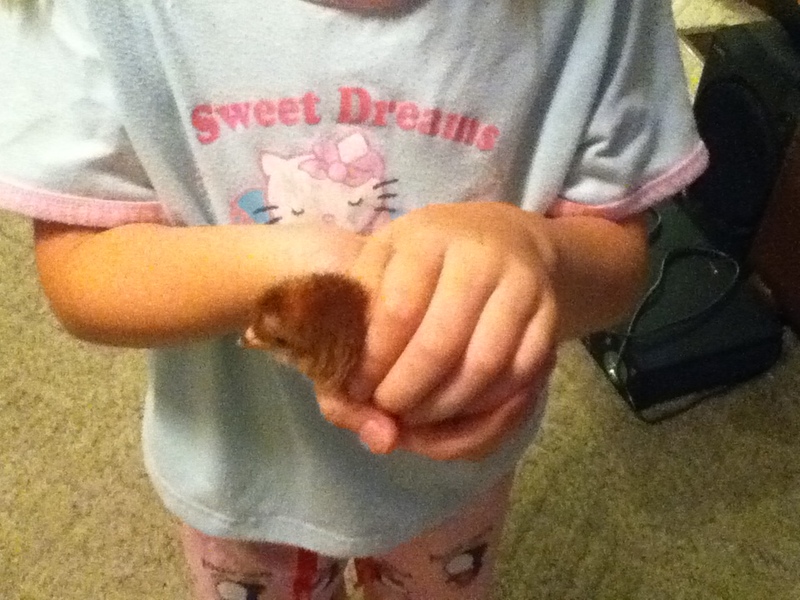 Here are a few photos of my bean experiment. These are the soaked beans that have been rinsed with clean water. These are the beans in the canner before cooking with the water, oil and salt. Here I am lining up the arrows to be sure to close the canner properly. These are the beans after cooking. The water level is still the same. As I look putting these on the blog, the coloring is different because it was later in the day and I had the kitchen lights on, but the amount of liquid was about the same. This was fun for me. I am usually afraid to try new things. Next, I want to try to can something in the pressure canner. Trying out our new snow blade and tire chains that we bought for our Polaris. More plowing. I think he is having fun, and calling it work. School is in full motion. 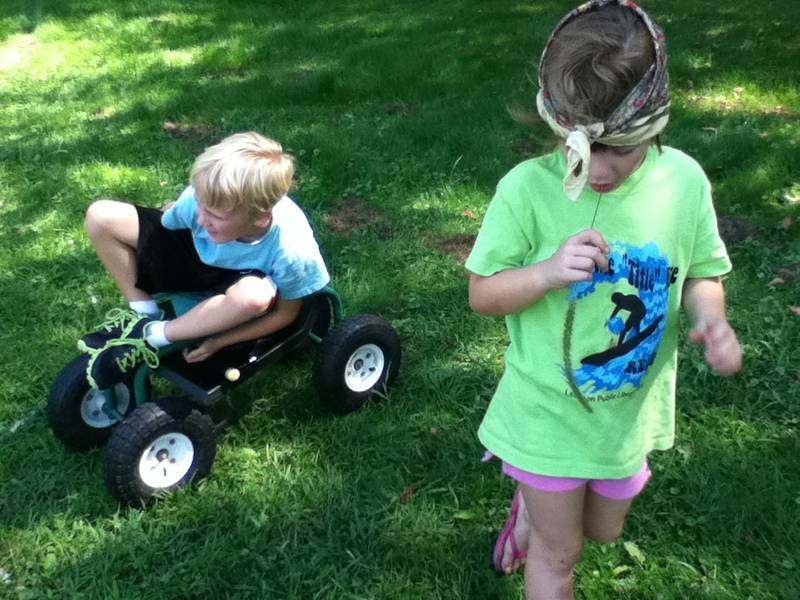 All of the activities have started. I had 2 Cub Scout meetings, 1 Boy Scout meeting, Cross Country practices to pick up from, a Cross Country meet on Thursday, a Doctors appointment with one of the kids, etc. I also had to run to the pediatrician’s office to get a copy of a shot record. Today R had a Cross Country meet at 8 am. We had to get up at 6:15, just to get there on time. It is go, go, go. I have been collapsing into bed, exhausted, each night. I have been keeping up with the house work and laundry, but not much else. Thankfully, my husband is continuing the momentum with the cleaning. He and my son R want a tool and I said if they got the other half of the basement cleaned out that they could get it. It keeps them both motivated! I have a Doctor’s appointment on Monday. I will be 28 weeks. Crazy to think about. I am hoping for having this baby around 38 weeks so that she isn’t too big. That is 10 weeks or about 72 more days. When I think in terms of days instead of weeks, I realize that she will be here before we know it. I have almost everything that I need to get started except for the car seat/stroller that I want. A nice lady gave me clothes, burp cloths, bibs, coats, etc. for up to 2T. I will need to fill in with what I don’t have, but that was a huge blessing. Someone gave me a crib, a portable high chair, and a pack and play. I bought a bouncy seat and a car seat cover, to help keep her warm without having to put a snowsuit on her just to leave the house. I would like to get a sling, but it’s not critical for a little while. I am definitely thinking about getting ready. As the belly grows, so does making sure I have all that I need a priority. Here are a few pictures of what we have been up to! Have a great weekend! 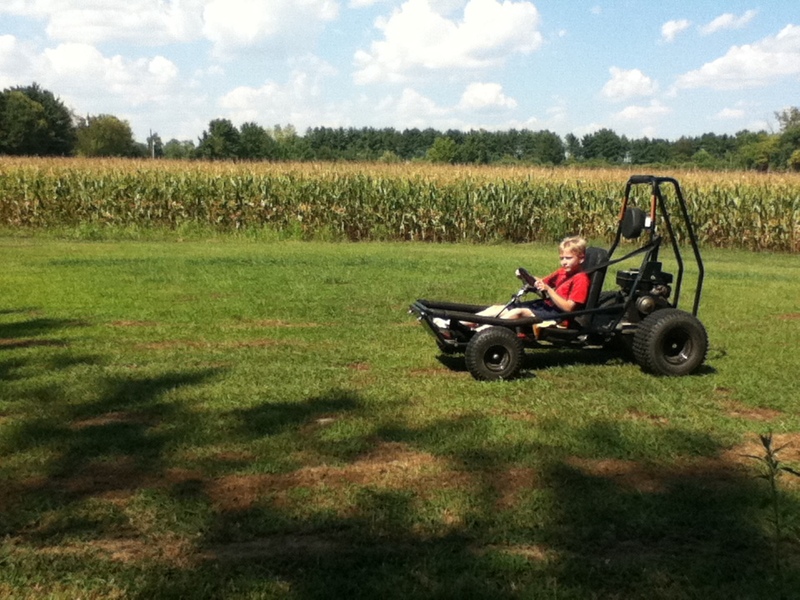 A friend over to play and ride go-carts. 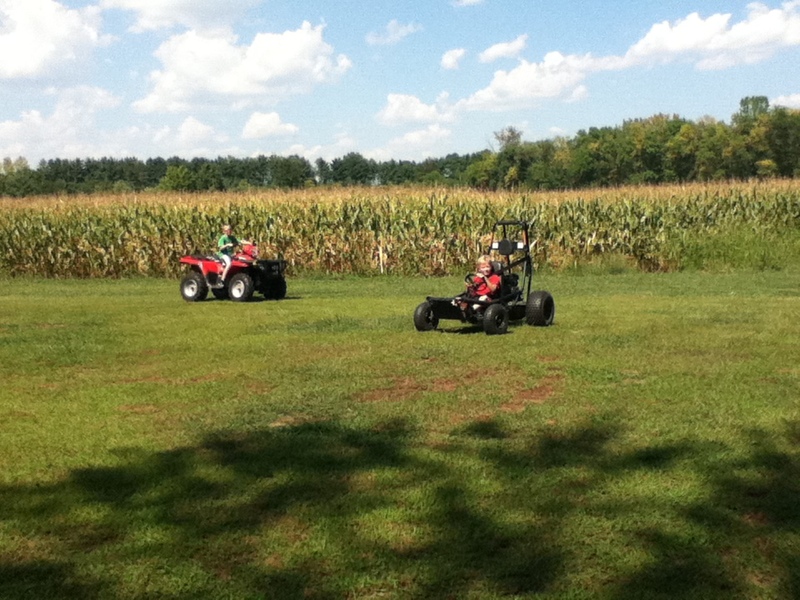 Chasing after the friend on the Polaris. Watching kids chase each other. 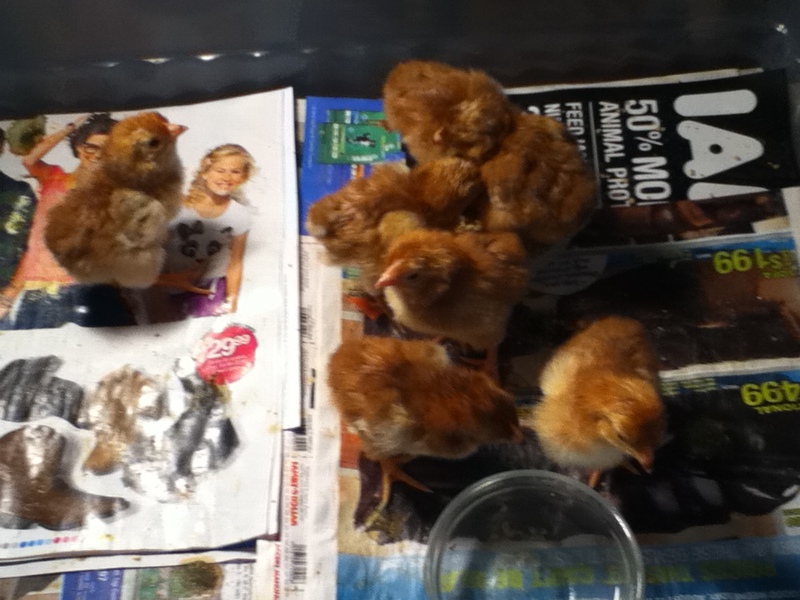 Hatching out some new chicks to replace the ones who keep being eaten. 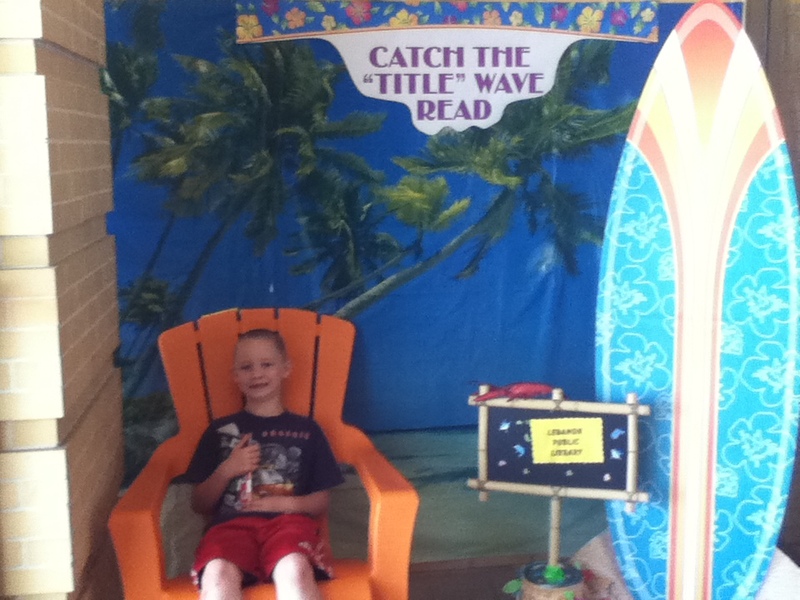 S finishing up the Summer Reading Program. He was the only one that cared about getting his picture taken. Our new shelves that have our stuff organized! Extra food and Christmas stuff. I still need to go through the Christmas stuff and get it organized. Our pantry is small, so I put extra stuff down on the shelf. Sorry for the lack of posting this week, but the energy that I had has left me. I hope it is temporary…but I’m not sure. When I was pregnant with my daughter 5 years ago once I hit the exhausted stage, it never left until I delivered her. I keep telling myself that this pregnancy is different, because I was in pretty good shape when I got pregnant, but I’m still not completely convinced. I haven’t been sleeping very well, so that may be part of it. With this 3 day weekend, I have been able to sleep in a little bit more, so I hope that helps. I have been continuing with the cleaning here and there. The mornings are my best bet to get something done. 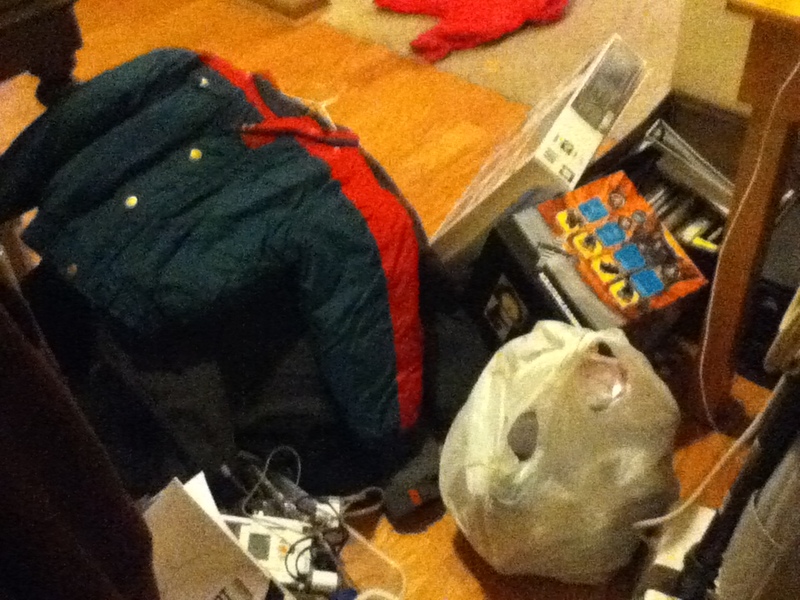 I did get the coat closet cleaned out and 2 bags went to Goodwill. 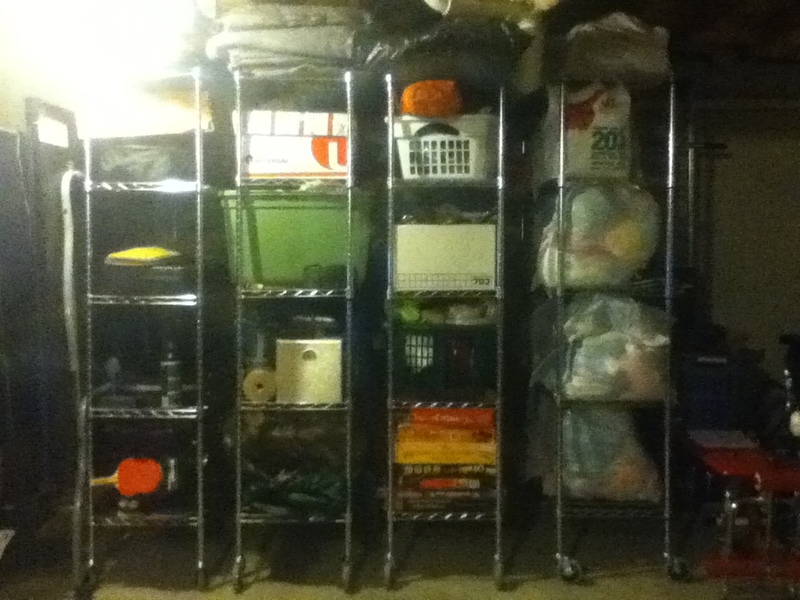 Also, I got our game closet cleaned out. I took the games that no one plays with and put them on a shelf in the basement. If no one plays with them for a while, they are going to Goodwill too. 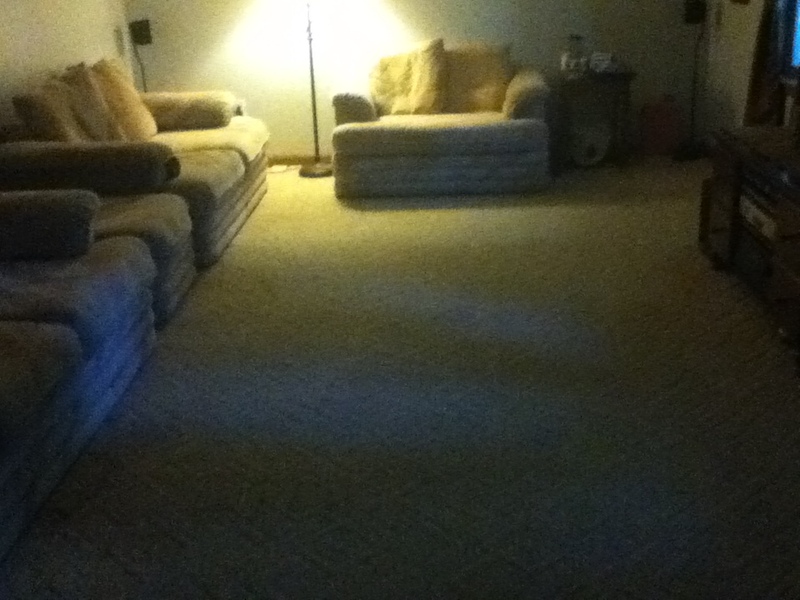 Our basement is about as clean as it can get. I am amazed that we have gotten this far! 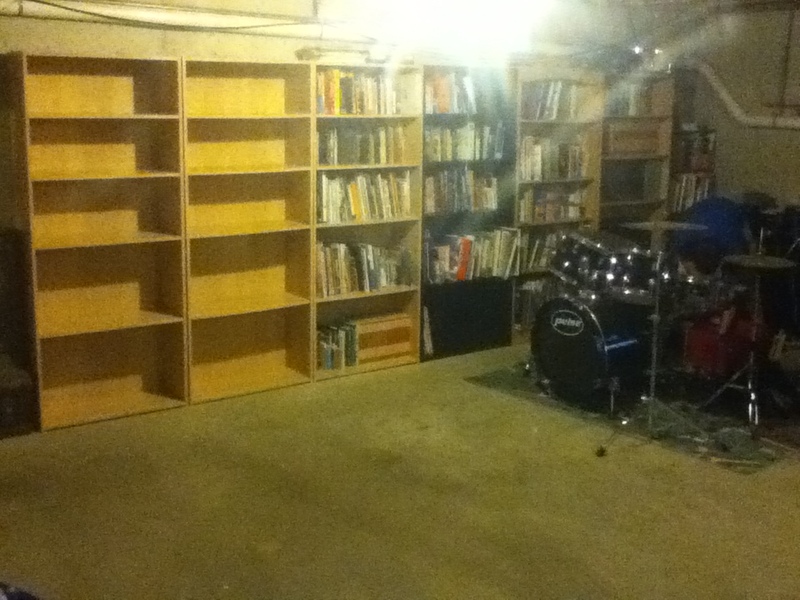 We need to move a big self with extra food on it to a better spot and put up another bookshelf or two. I also am working on the laundry room shelves to make them more functional. I cleaned off 4 of the stationary shelves and I talked my husband into putting wheels on the wire shelf in the laundry room so that I can move it and clean under it. 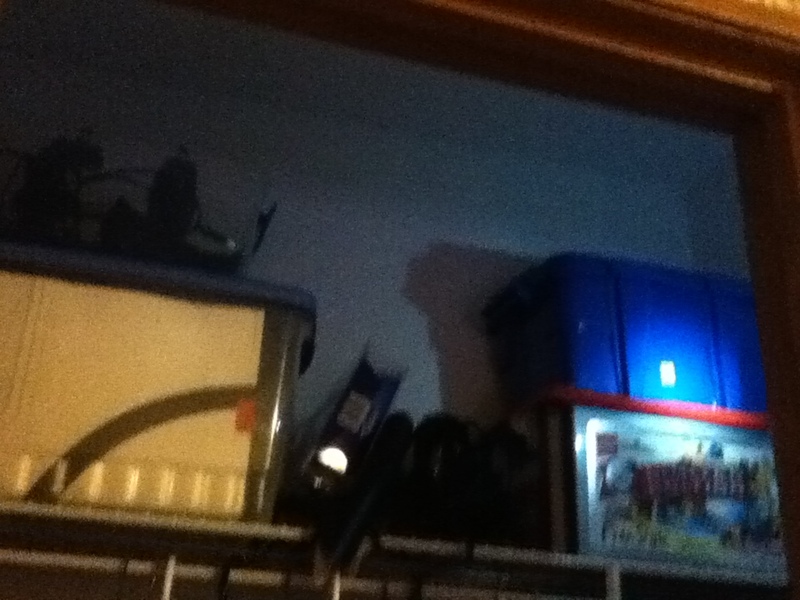 It has been nice to have the shelf, but it is too low to clean under, so that has made it a pain. With 6 kids I need to clean under it regularly. Also, we have a gravel driveway and this is our main entrance into the house with the kids, so tons of debris come in with them. We are making good progress. Most of the work is being done by others in the house right now. I just don’t have the energy. But done is done! Tomorrow I will be 27 weeks. This pregnancy is going pretty fast. A break in the heat would be really nice. I can’t decide if it is the heat or the baby sucking all of my energy. I’m hoping for the heat. Even if I don’t end up getting more energy, I have gotten a lot done in preparation for this baby! 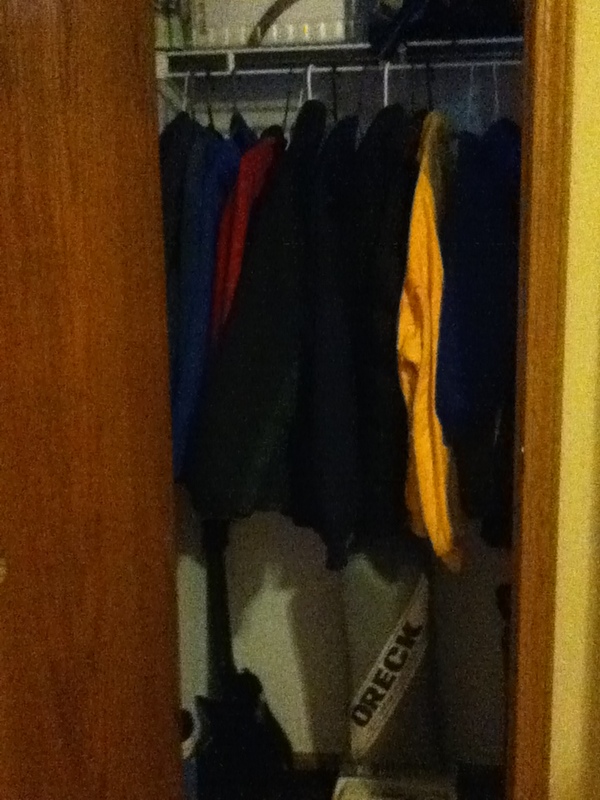 Here are a couple of pictures of the coat closet. I forgot to get the before, but I at least got the during. I hope you have a great long weekend! 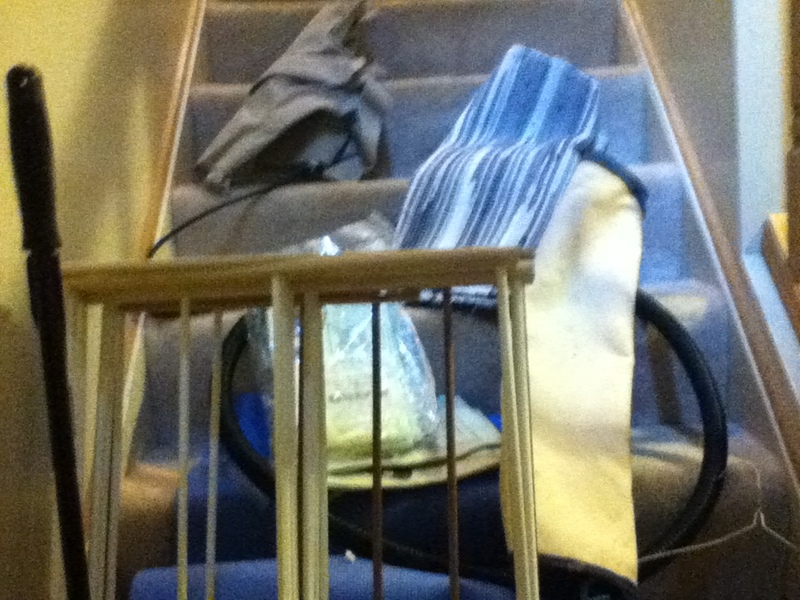 A lot of stuff pulled out of the closet and put on the steps to reorganize. Another pile going to Goodwill! Yet more stuff to get organized. The bottom of the coat closet all cleaned out!